Enjoy riding motorbikes? Well, then don’t let poor nutrition or fledgling health keep you from hitting the road. Motorcycling is a sport, and like any sport, it requires a certain amount of investment towards health. Cardiovascular health, a steady mind, and quick reflexes are just a few requirements because motorsport does cause physical and mental attrition. Good health is not the first attribute that strikes most people, when we’re talking about motor biking. Nevertheless, it is important. And if we aren’t just talking about two-wheeler sports, living a balanced lifestyle and getting the right nutrition is never a bad thing, is it? Whether it’s working, tackling aging, or just living your best life, keeping good health is more about quality of life than longevity. 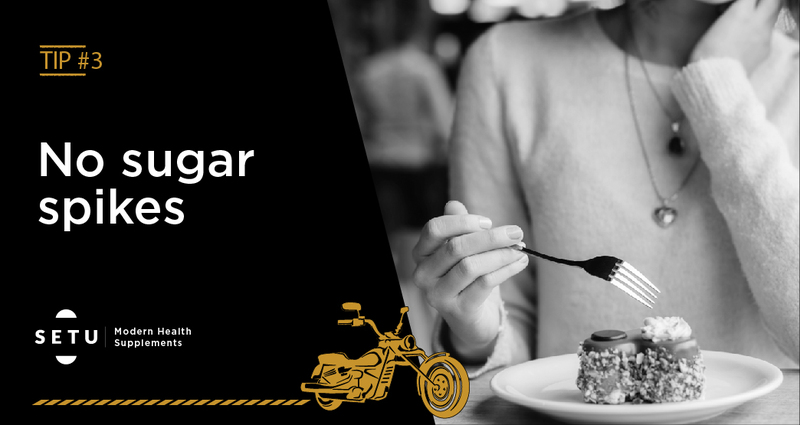 You can be into two-wheelers, four, or just walking… taking small steps towards a nourishing lifestyle is the key to putting your best foot forward. 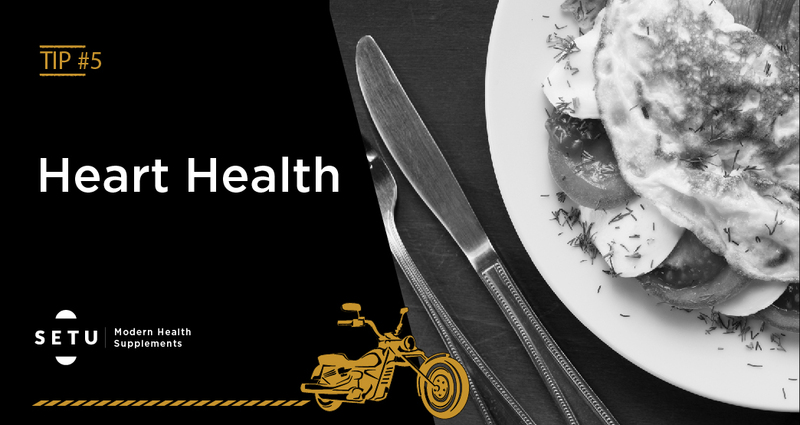 A lot of health necessities that supplement motorcycling as a sport, or hobby, are great ways to keep your general fitness in check, as well. 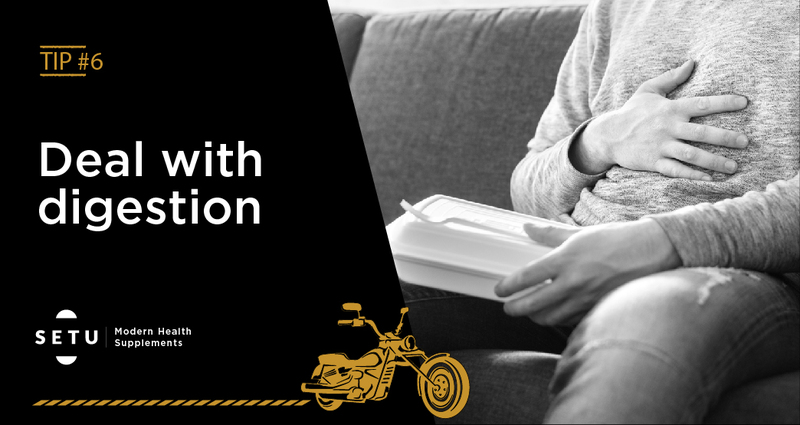 Cardiovascular health and staying agile are just a few points to keep in mind for motorcyclists. 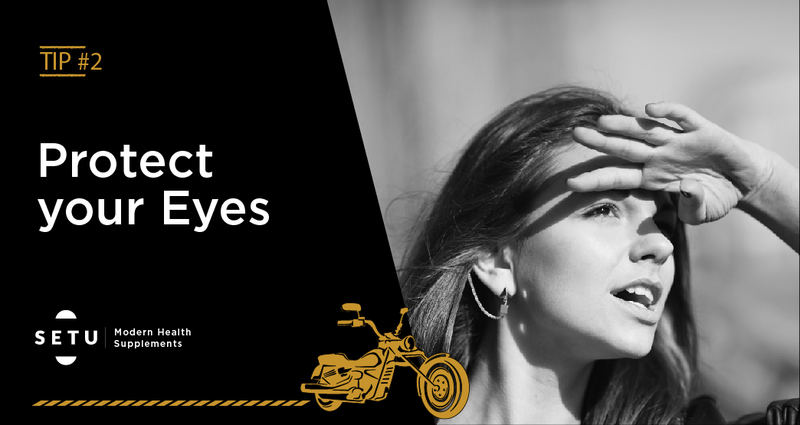 Keeping a few of these points in mind will take your, life, and motorcycling game to the next level. It’s important to drink enough water and stay hydrated. 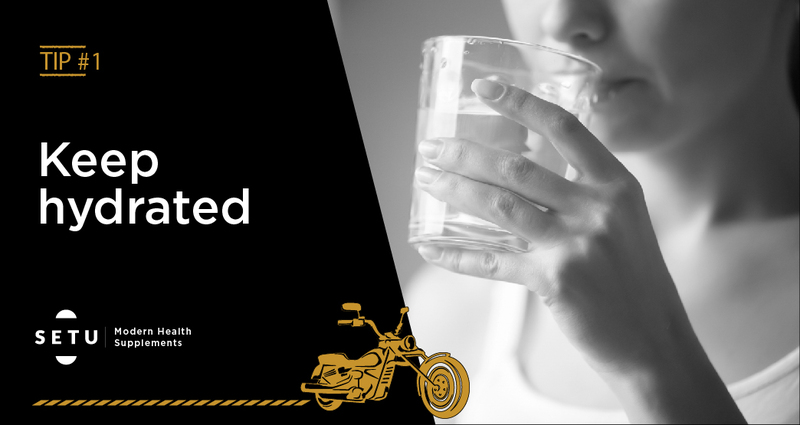 Motorcycling equipment and being on the road for so long can cause you to sweat extra. This will dehydrate you, if you don’t replenish your body with water. If you’re feeling extra dehydrated, electrolyte water is a good way to restore the balance. Hours of sun exposure can harm not only your skin, but your eyes as well. So, staying hydrated, using SPF and wearing good quality eyewear can protect you from the harmful UV rays too. For added benefit, supplements like Setu Eye Max can significantly promote hydration in your body, due to its NAG content, that adds moisture to the body (eyes included). Its bilberry extract and other potent, natural ingredients, can help protect your skin and eyes from free radical damage and UV rays, as well, acting as a natural SPF. You don’t want your glucose levels going up and down too much. The spikes throw you off balance while riding, and in the long-term, affect your body in multiple negative ways. To keep your body agile and concentration on point, don’t eat sugary foods. Keep a check for that added sugar, that sneaks into multiple processed foods. Since carbohydrates also break down into sugar, you want to avoid ones that raise your glycemic index, and opt for carbs that are complex and fibrous. Setu Sugar Shield contains alpha lipoic acid, along with necessary vitamins. This will keep your energy high, without sugar. It will also help your body digest excess glucose better. Obviously, any exercise is great for our bodies, riding motorcycles, or not. 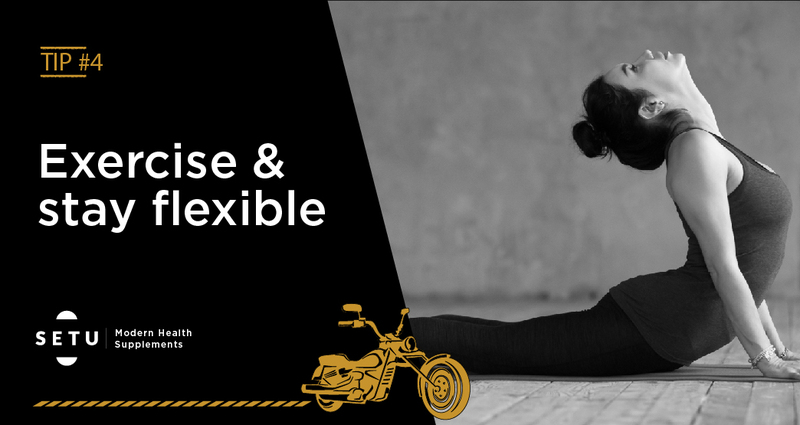 But, for those who do spend hours on a bike, it’s important to stay flexible and agile, to better maneuver the motorcycle and to keep your body alert. Yoga, dancing, and pilates are great ways to keep your body prepared for the road. Taking the Alpha Lipoic Acid supplement, will promote this. This supplement has large, but digestible amounts of ALA. The ALA will boost cellular regeneration, keeping you fit and fighting. This supplement will also aid in keeping your metabolism in check. Your cardiovascular system (heart, blood vessels and veins) play a crucial role in your riding performance. If you want to improve your stamina, eating good fats and a high protein, low carb diet will keep you lean and your heart in stellar condition that will help you deal with the many challenges of riding. However, sometimes we aren’t getting all of the vitamins and nutrients we need in our daily diets alone. That’s where supplements come in. Setu range of nature-derived, cardiovascular health solutions are heart-healthy supplements have been researched and tested. 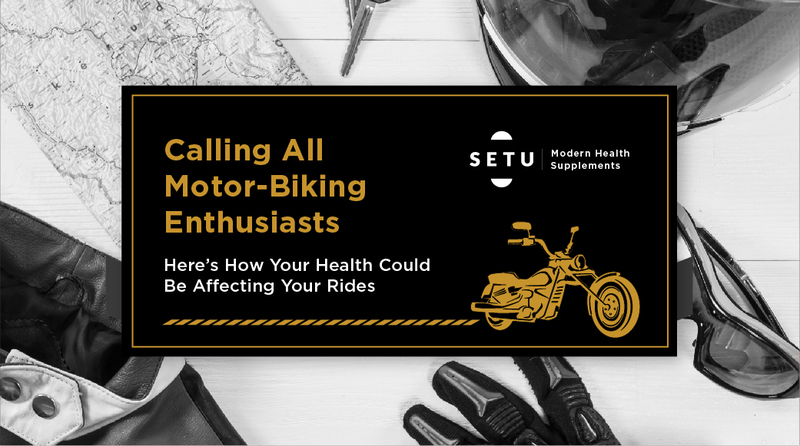 Whether you’re tackling blood pressure with Pressure Pal or providing your body with nutritious heart multivitamins and minerals in the form of Beat It!, Setu has got it covered. As we age, we often tend to form digestive issues due to years of system abuse, allergies, or a sedentary lifestyle. While exercise, eating right, and taking vitamins and minerals help, it’s important to take the time to diagnose your problems. What is it that’s triggering these issues and how can you fix it? While you’re out riding, digestive issues can seriously lower your concentration. And that’s never a good thing, is it? And whatever the issue, supplement your gut with YourGut! It’s got far more probiotic strains than plain, old yoghurt. Adding this to your meal plan will keep you gut happy and healthy, which also has profound effects on mental health and overall wellbeing. Once you’ve got your health in order, equipment, long hours, and rough terrains become far more manageable. Just remember to wear protection gear and practice safe motor biking!